Here we are right in the middle of the holiday season... and we have a well-populated 189th Carnival to present to our readers! All you have to do is get past the following game. If you say "hey, that's a nuclear plant!" you get one point. You can only pass if you can tell me either one of two things: What plant this is, or else what category of art this illustration belongs to. That latter description may not seem clear right now, but it will be when I give you the answer. But before you get to see the answer, you have to read through (and hopefully click on a few of the links for) the Carnival entries! California was scheduled to receive a lump of coal for Christmas by Jim Conca, at least, due to having been naughty and shutting down San Onofre Nuclear Generating Station. This lump of coal actually comes in the form of an extra 18,000,000 tons of CO2 per year delivered to the atmosphere by replacing the 15 billion KW-hrs of electricity each year with a mixture of gas, wind and solar power. Also lost will be 1500 local jobs and $50 million of revenue to southern California each year. When she worked at DOE, one issue Gail Marcus dealt with was the concern about the retention of data from experiments long after the research facilities had been shuttered and the researchers who had done the work had moved on. In a post at Nuke Power Talk, Gail recounts her experiences and points out that a recent report finds that the problem exists for all types of scientific research, and indeed, the degree of loss is more severe than she had imagined. Although it is difficult to think about data preservation when one is in the thick of an experiment, she notes the importance of doing so. Japanese politics are shifting to a pro-nuclear stance. Various pro-nuclear mayors are being elected, for example. The Terrestrial Energy integrated Molten Salt Reactor, and a companion supercritical CO2 turbine are both under development and could be ready for production in about ten years. This combination could have a higher power density than even submarine nuclear power plants. Impressive power density promised by molten salt reactors could make a whole new range of vehicles move from the impossible to the possible. One of the terms often used incorrectly when discussing the Fukushima accident is "hot particle." This term unquestionably sounds alarming, but what does it really mean? By examining the most likely meaning, we find that application to atmospheric releases from the Fukushima Daiichi plant is entirely inappropriate. Rick takes a look at what the availability of electricity really means to us today through relating his own experiences with power outages (and ramifications thereof) where he lives. What do we think about when we consider electricity? Do we think about emissions, or efficiency without considering reliability and, perhaps more sobering, availability in the first place? How about the physical limitations of the electric distribution network -- the grid? Even with advantageous site attributes and monopoly utility customers that are willing to commit their captive rate payers to pay more than twice as much per unit of power as they have ever paid, Jim Gordon's Cape Wind offshore wind power vision remains stuck at the financing stage. Finding the money required to build the project will be even more difficult if the project fails to "begin construction" before January 1, 2014. This news has been breaking over the holidays: the state and Vermont Yankee have stopped suing each other in Federal Court, and Vermont Yankee will pay more than $40 million to various funds (including the state). However, the deal still has to be approved by the state Public Service Board. Patty O'Donnell is chair of the Vernon Board of Selectmen: Vermont Yankee is located in Vernon. In this guest post, O'Donnell requests the Public Service Board not to add complex and onerous conditions to its approval of the final year of Vermont Yankee's operation. Reducing carbon pollution from electric power generation: What works? In the nearly 17 years since the Kyoto Protocol, many countries, especially Germany, have embarked on major efforts to reduce their national carbon footprints. How have those efforts paid off? Steve Aplin of Canadian Energy Issues suggests two fundamental criteria on which to judge the nature of the payoff. These are price, and carbon content, of electricity per kilowatt-hour. He introduces the Electric Power Carbon-Price Matrix as a tool for both evaluating ongoing carbon reduction efforts and guiding electric power generation investment in the post-Kyoto world. That's it for this week's Carnival entries! Quite a wide, and thought provoking, spread of topics as we begin to reflect on 2013, I'd say. All that's left is to tell you what that picture was. If you said "Oyster Creek Generating Station" or some permutation thereof containing "Oyster Creek," you win. However, this illustration also falls into the category of "pre-construction artist's conception" art (which I happen to like to collect) so that if you said something along those lines you also win. "Oyster Creek Plant. 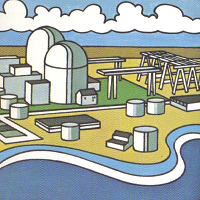 Artist's drawing of the Jersey Central Power & Light Co.'s proposed Oyster Creek 515,000 electrical kilowatt boiling water type nuclear power plant, 35 miles north of Atlantic City. The company announced early in 1964 that a nuclear generating facility had been selected for construction 'on a competitive basis' with fossil fuel. The plant would be built without AEC financial assistance. A provisional construction permit for the facility was issued by the AEC on December 15, 1964." ... Did everybody catch the key phrases in this description? Competitive with fossil fuel. Without AEC financial assistance. Yes, absolutely true. We live in a world today where the narrative on nuclear energy has largely been stolen by liars. That's right - liars. People who know the truth (or, maybe, should) but deliberately promulgate falsehoods. This has led to the general notion that nuclear energy is not, and never was, economic... and requires subsidy. "...though private industry was initially reluctant to enter the nuclear industry as the nuclear fuel chain appeared to be neither safe nor economically profitable..."
Really? All we need to do is look at this article to find out that industry was already investing in nuclear energy research prior to being allowed to construct civilian owned and operated nuclear plants. (Look for the portion wherein President Eisenhower writes to Congress on 'Domestic Development of Atomic Energy.') Industry was convinced that there was a future, even though it did not know when profit would be achieved. Always, in industry, research and development comes before profit - a fact clearly lost on anti-nuclear activists who cite the early period of R&D as unprofitable. We know that Admiral Hyman Rickover testified to the Joint Committee on Atomic Energy in 1957 (when discussing the Shippingport Atomic Power Station) that nuclear power was not at that time profitable, and that he did not know when it would become profitable. We can also clearly see that by 1964 when Oyster Creek was announced and ordered that utilities saw that nuclear energy had advanced enough to be profitable -- or else they wouldn't have ordered the plants at all. Some of the best, short quotes we can find to explain the position of utilities back during the heavy first build-out of nuclear power in the United States are to be found in the old, vanishing brochures that were produced for visitors, for those who wrote asking for information, or for educators and students. Let's close out this Carnival and drive home the point by looking at a few quotes. "Millstone Station generates electricity for 51 percent the cost of an oil-fired station and for 82 percent the cost of a coal-fired station. To generate the amount of electricity produced by Millstone 1 and 2 with coal would require a mile-long trainload every day. The additional cost for oil would add about $5.50 to the monthly bill of an average residential ratepayer." Base-loaded oil cost per kilowatt-hour: 3.46 cents. Base-loaded coal cost per kilowatt-hour: 2.15 cents. (US average.) Millstone Units 1 and 2, 1978: 1.76 cents per kilowatt-hour. When comparing the relative economics of electricity from nuclear and fossil fuel stations, capital and fuel costs are the most significant factors. Nuclear plants do cost more to build, but the cost of uranium fuel is so much lower than oil or coal that they save money for the electricity customers. It's like spending more money for a car that gets better gas mileage, or paying more for a high-efficiency air conditioner or gas heating furnace or boiler. The car saves you considerable fuel, and the air conditioner and gas heating equipment lower your electric and gas bills to more than make up for their higher initial price tags. Just one plant the size of Salem can save the equivalent of one billion gallons of oil a year, representing huge savings to PSE&G customers. Financial benefits have accrued to PSE&G's customers from the operation of both Salem and Peach Bottom from 1974 through 1983. The energy produced from these units has already saved our customers over $2.5 billion in fuel costs as compared with generating the same amount of electricity from oil units. Although (this is) not a rigorous economic evaluation, it clearly illustrates the tremendous economic benefits nuclear provides. Nuclear may hold only a slight economic advantage over coal in the northeast, but nuclear and coal are not in competition. Both are needed. However, it should be noted that if new nuclear plants were built as routinely as they are overseas in 6 to 8 years, the capital cost of a nuclear plant would be reduced by about one-third and nuclear electricity would be considerably cheaper than coal as well as oil." Boston Edison's business is to provide electricity to customers in the most efficient, reliable and economical manner possible. Right now that means using nuclear fuel as part of the mix of fuel needed to produce that electricity. Currently Boston Edison uses oil (70%) and nuclear power (30%) to make electricity. Since 1970, the cost of oil, virtually all of which is imported, has increased more than 1500% - from $2.22 a barrel to more than $35 a barrel. At today's costs, using oil to produce electricity is not economical for anyone. At the same time, the price of uranium, a domestic fuel used in a nuclear power plant, has remained stable. And, a nuclear power plant uses fuel more efficiently than fossil-fired plants. For example, to generate 7,000 kilowatt-hours of electricity, only one gram of uranium is needed, compared to 2.5 tons of coal or approximately 12 barrels of oil. 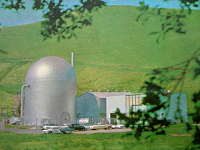 As a result, Pilgrim 1, Edison's nuclear plant, plays a major part in the company's efforts to reduce New England's dependence on costly and uncertain oil supplies...."
As it turns out, we don't need to look too far at all to disprove the statement about industry participation and nuclear economics. I hope you've enjoyed this week's Carnival and subsequent foray into both nuclear economics and nuclear plant advertising / PR archaeology. 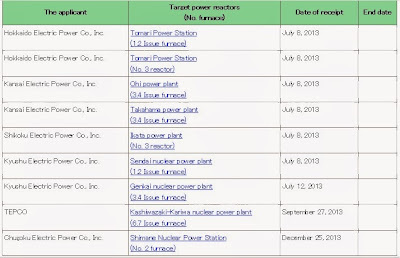 Very quietly - so quietly, you might not even notice here in the United States - a long list of applications from Japanese utilities to the Nuclear Regulation Authority for inspections of reactors intended for restarting has backed up. 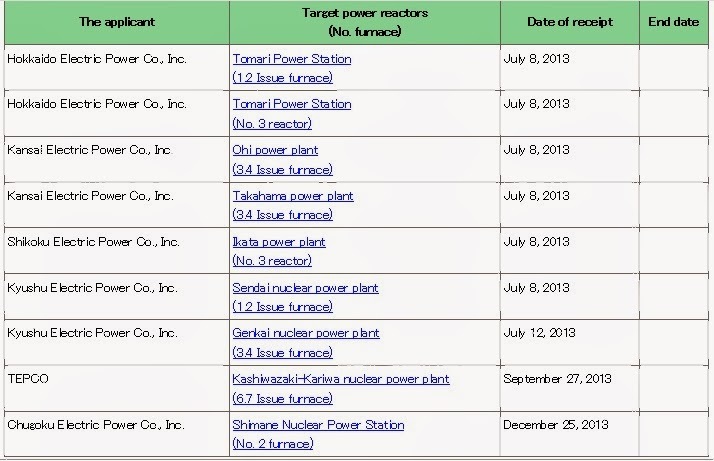 As of today, there are sixteen reactors for which applications launching the restart process have been submitted. Below is a chart showing all of those up until Christmas Day 2013. This chart has been translated from this page on the Nuclear Regulation Authority's website. Click to enlarge it. As we can see, ten applications were received by the NRA on July 8, 2013 with another two on July 12. In September, as I'd been expecting for some time, TEPCO applied to restart Kashiwazaki-Kariwa Units 6 and 7; Chugoku Electric applied to restart one unit at Shimane on December 25th. Not shown on this chart: Tohoku Electric Power Company applied to restart Onagawa Unit 2 on December 26; receipt of this application announced by the NRA on December 27. Also not shown on this chart: Japanese press have reported that Chubu Electric Power Company will apply to restart Hamaoka Unit 4 in the first quarter of 2014. Below is a clickable map of all nuclear plants in Japan. From left to right, the key shows solid colored units as 'operating,' while units 'under construction' have hashed lines. Units planned are empty shapes and units cancelled are crossed out. This map is somewhat old - no nuclear plants are presently operating in Japan, so "operating" should be taken as "operable" with the exception of all six plants at Fukushima No. 1 Generating Station (Fukushima Daiichi) which are all decommissioning. Also noted in news today (12/27) was the fact that another facility under NRA regulation but which is not a nuclear power plant has announced intent to restart work. This is the Japan Nuclear Fuel reprocessing plant at Rokkasho; Japanese media are reporting that this plant will be applying for its restart inspection on January 7th, 2014 and intends to be ready to operate by October 2014. We now have sixteen nuclear units at ten sites in Japan which have entered the application process, with another reactor at another site (to give seventeen at eleven sites) expected early next year. Of further interest is another news item today, carried by NHK World which states that the NRA is about to announce its finding that the fault so highly described and examined below Kansai Electric Power Company's Ohi Nuclear Plant is not active. According to NHK, there were six nuclear plants targeted for highly specific geological fault examination; Ohi is the first to have a clear settlement of the issue on the way, either way - and this one is positive. Kansai Electric was among the early applicants, filing for these two units in July. Ohi Units 3 and 4 are the only nuclear plants in Japan to have restarted after the Fukushima Daiichi accident. Coverage of that process on this site included the announcement that the reactors were approved to restart in June 2012, the announcement that Unit 3 had begun pulling rods on July 1, and the announcement of the startup schedule for Unit 4 as well as a description of some of the upgrades and modifications to that plant. The listing does leave a very large number of units in question; the units selected to restart are generally the newest and most advanced units at any given nuclear plant site. What the future holds for smaller, older units is still absolutely not clear at this time. My expectation would be that application to restart these units would follow considerably after the newer units had been put in operation, and would have to be balanced against modifications required to older units by new NRA standards. It's not out of the realm of possibility that some older units at some sites wouldn't be economic to refit and restart - given that they could be placed in a SAFSTOR status and not decommissioned until an entire nuclear generating station was decommissioned. This would defer their decommissioning costs; considerations such as these will however be very highly specific, unit-by-unit, so that a complete estimate across Japan isn't quite possible yet. These filings with the NRA are not a surprise to those of us following the situation in Japan closely; the Japanese economy needs the power these nuclear plants can provide so that their incredible fuel costs (at present very high due to imports of fossil fuels) can go down, and so that their manufacturing can get back going -- the country needs to reverse its trade deficit. The present government has now made it abundantly clear that the "no nuclear" mandate is dead - and these forces together with the desire of the utilities to get back to making money selling their product (electricity) has led to a pile of paperwork for the NRA to review. I'll be following this process as closely as is possible given the voluminous documentation involved, most of which is in Japanese. What's important of course is to understand that safety is paramount in all of these nuclear plant restarts. I wrote extensively some time back about the massive efforts that have gone into just two of the nuclear plant sites that are applying to restart; it's a matter of grave importance to the economy of Japan, and the future of its nuclear industry. The best possible outcome is that these restarts go as smoothly as the almost-unnoticed run of Ohi Units 3 and 4 after the Fukushima accident, and that Japan's economy becomes the big news - not its nuclear plants or its regulator. Chubu Electric Power Company - Hamaoka Nuclear Power Station Today and Tomorrow. This web page is an excellent addition to those linked in my piece on ANS Nuclear Cafe entitled "Preparing to Restart" which is linked in the last paragraph of the piece above. Modifications, improvements and readiness to meet new standards are all discussed in this impressive page complete with video and illustrations. Today, Chubu Electric Power officially applied to the Nuclear Regulation Authority (NRA) for a safety review of Hamaoka Unit 4, as was predicted in the article above written in late December 2013. According to Kyodo News, Chubu now expects the seawall around the plant to be finished in September 2015. This makes 17 reactors applied for restart safety review at 10 sites. 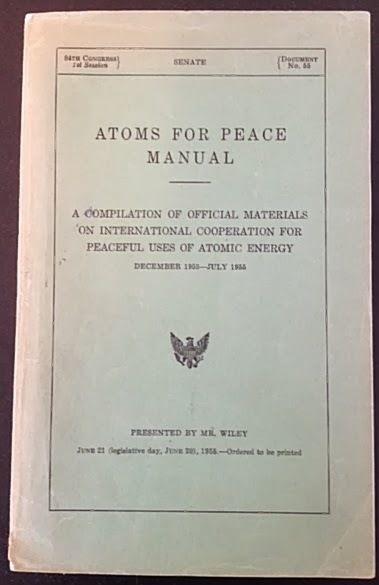 Above you see the front cover of my copy of the ATOMS FOR PEACE MANUAL, which was printed by the Government Printing Office in 1955 and which is a compilation of important papers, commentaries and regulations pertaining to peaceful use of atomic energy ranging from the December 8, 1953 date of President Eisenhower's famous speech (often referred to today as his "Atoms for Peace" speech, this volume lists his speech's official title as "Atomic Power for Peace") through roughly the date of publication. We find ourselves 60 years out now from that historic and often-mentioned speech, so often credited with launching the effort to spread the benefits of nuclear technology nation- and world-wide. It's fitting today to look at this and perhaps one other book at the very least. "Three dates have assumed deepest significance for mankind. begin now and continue to make joint contributions from their stockpiles of normal uranium and fissionable materials to an international atomic energy agency... The more important responsibility of this atomic energy agency would be allocated to serve the peaceful pursuits of mankind. Experts would be mobilized to apply atomic energy to the needs of agriculture, medicine, and other peaceful activities. A special purpose would be to provide abundant electrical energy to the power-starved areas of the world. On December 4, 1954, the United Nations General Assembly unanimously adopted a resolution endorsing the proposed establishment of an International Atomic Energy Agency. The resolution directed that an international technical conference be held under the auspices of the United Nations for the purpose of exploring means of developing the peaceful uses of atomic energy through international cooperation. August 8, 1955 marked the opening of the International Conference on the Peaceful Uses of Atomic Energy. Between these three historic dates of December 8, 1953, December 4, 1954, and August 8, 1955, an important and promising era of world history has begun to unfold." Important, and promising indeed. It was an age in which we had just seen the first practical nuclear plant prototype, the Submarine Thermal Reactor at the NRTS, Idaho Falls produce its first power, and in which we had just seen the announcement of the first large commercial nuclear power plant - both of these events preceding Eisenhower's momentous speech. In 1953, the US Navy's large CVR project intended to result in a nuclear power plant prototype suitable for use in an aircraft carrier was cancelled. 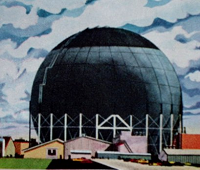 This project's complete design information was extrapolated into, and in many ways actually directly transferred into a new project to build a civilian (or commercial) nuclear station in July, 1953. 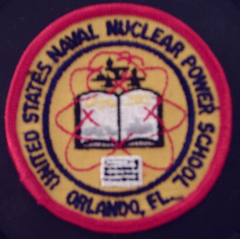 Admiral Rickover was given overall responsibility for the project, and (naturally) Westinghouse was awarded the contracts to "design, develop and build the reactor plant" (according to "Shippingport Pressurized Water Reactor.") In March, 1954 - only few months after Eisenhower's speech and over a year before the Atoms for Peace Manual was printed - Duquesne Light Company was chosen to host the plant. The siting of the plant gave the project its lasting name - the Shippingport Atomic Power Station. This was not the only project being mentioned in the press. Other companies had other ideas, and after the Shippingport announcement everyone seemed to scramble to develop other technologies for power production.. to say nothing of the other many uses of nuclear technologies. The average layman may only vaguely understand the technical process by which vast amounts of energy are released from the splitting of the atom. But he can definitely appreciate the ultimate significance to himself and to his loved ones in the making available of plentiful low-cost energy, particularly in power-short underdeveloped areas. He can appreciate the miracle of new healing weapons for the eradication of man's age-old enemy of disease and new tools to increase food production so as to eliminate his age-old enemy of hunger. 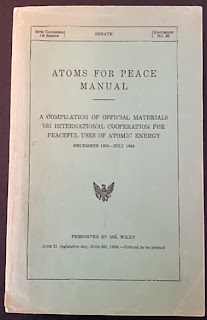 Indeed, few news developments within the memory of living man have more stirred the imagination of human beings everywhere, than has the atoms-for-peace effort. Few developments have provided man with more substantial hope that, once and for all, men might be able to break the tragic pattern of the diversion of so much of science to war, a pattern which has brought such suffering and dread to mankind." None of what Mr. Wiley said in 1955 is now untrue. All of the promises of nuclear technology stand today - they exist, TODAY - just as they did in that early period when the promise of a better tomorrow led men and women forward on a quest to understand and develop incredible new technologies. It is right that we reach back occasionally now and touch those sentiments, undiluted by apprehension and unclouded by fear. The "better tomorrow" promised therein still awaits. The "only remaining complete physical symbol" of Eisenhower's "Atoms for Peace" program, says MARAD's Erhard Koehler, is the nuclear powered prototype and World ambassador NS SAVANNAH. I recently saw the ship again (as many of you know) after twenty years, and a large photo essay of that experience is posted at ANS Nuclear Cafe. It's time for the weekly roundup of the best of the pro-nuclear bloggers and writers - the Carnival of Nuclear Energy. This post-Thanksgiving holiday edition is, expectedly, smaller than the norm in terms of the number of contributors. However, we have some interesting and unusual entries this week that make visiting the links more than worthwhile. I'm also pleased to announce that Atomic Power Review will, in all likelihood, roll over 600,000 page views with publication of the 185th Carnival. Not so pleased, however, that I've forgotten to show you a photo and ask you.... "What is this?" This is clearly a photo that covers two pages - and it's in a very old publication that I'm not willing to disassemble. No credit is given for "big metal things" as an answer... and yes, of course, these are nuclear components. Or.. and here's a hint.. you could also quite easily and correctly say that these are pre-final fabrication components of a larger component. The answer after the Carnival entries! The author takes a look at time travel as conceived in fantasy and cinema ... describing this week's entry as "fun and novel." I agree! And quite fascinating as well. Why was DOE's Low Dose Radiation Research Program defunded in 2011? In this post he traces what he found by digging through historical budget documents for the DOE Office of Science. The picture is not a happy one for people who are intensely interested in applying modern science to the question of determining the health effects of low dose radiation. a revolutionary new source of energy. At Nuke Power Talk, Gail Marcus reports on receiving the ASME Engineer-Historian Award recently at the ASME conference in San Diego for her book, Nuclear Firsts: Milestones on the Road to Nuclear Power Development, and lists the recognition she has received for the book as one of the things she has to be grateful for this Thanksgiving season. Jim Conca gives his explanation as to why the deal struck this past week between the P5+1 powers and Iran covering Iran's nuclear programs and aspirations is a good deal for everyone involved. This unit is a CPR-1000 pressurized water reactor, on which construction was started in 2008. The first unit at the site has been operating on a commercial basis since June, and now Unit 2 is set to follow in a matter of months. Pakistan's Prime Minister Announces Six More Nuclear Plants. According to Prime Minister Nawaz Sharif, Pakistan would produce 40,000 MW of power from nuclear plants until 2050 and the government's priority was to start work on power projects to overcome the energy shortage. That's it for this week's entries. The only thing left is to explain what that photo you saw above really was. 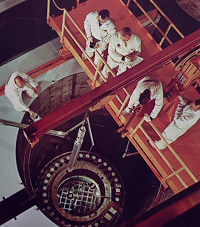 The caption in the advertisement notes that these components, made of Ni-Cr-Mo steel, are the reactor vessel closure head flange (nearer the camera) and what it calls the top disc. The flange forging weighs 74,000 lbs., while the top disc forging weighs 36,750 lbs. After forging, the pieces "were given preliminary heat treatment and preliminary machining. This was followed by quenching and tempering. Then came a battery of tests: ultrasonic inspection, tangential tensile tests, Charpy V-notch impact tests, grain size tests, bend tests and magnetic particle inspection." 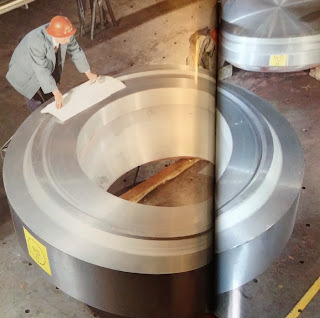 These two parts, and a number of others, would eventually be stacked and welded together to form what we today would describe as a ring forging design of reactor pressure vessel. The advertisement also encourages the reader to send for the USS six-page booklet on USS Nuclear Forgings. Which, I might add, you can bet I'll acquire on sight. Readers might recall the "ring forging" description regarding reactor vessels from the whole Doel / Tihange / Rotterdam Dockyard reactor vessel anomaly debacle, which is now fully resolved since the plants involved have been allowed to restart. (This chain of events marks one of the more significant events in which anti-nuclear prognosticators were dead, flat wrong... again.) Information about those vessels, and the early findings, can be seen at the following post I wrote for the ANS Nuclear Cafe some time back.